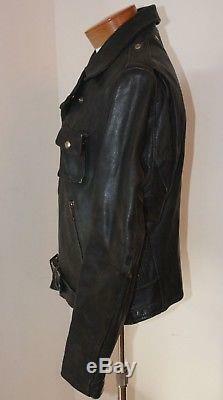 Vintage 40s 50s Horsehide Motorcycle Leather Jacket M Buco Harley? 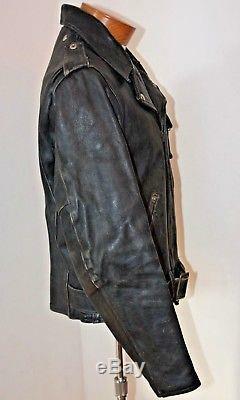 This jacket looks like Horsehide leather. 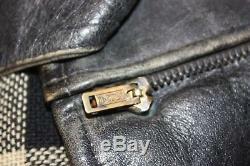 From the look of the zippers it probably from the 40's or 50's. 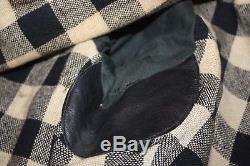 The lining is plaid and has leather reinforcements in the arm pit area. 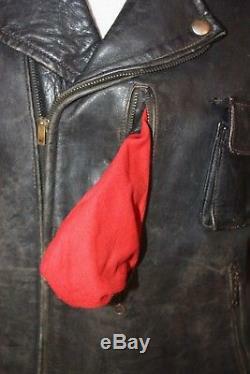 The exterior has several pockets that are cotton lined in red. 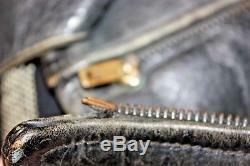 The zipper are Conmar and are all working. 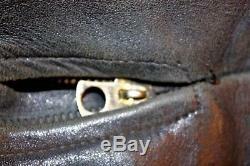 The center zipper has pulled away at the bottom (see picture) but still works. 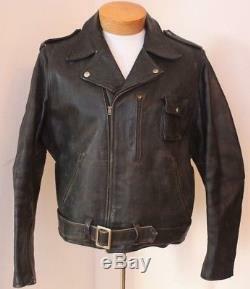 Overall this is a solid vintage jacket. The tag is missing but it seems well made. Jacket is still playable but could use a conditioning. No tears or stains or cracks. 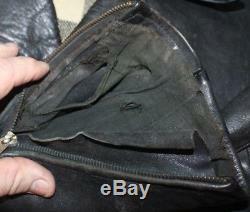 It has a great patina. No tag so I do not know who Made it. 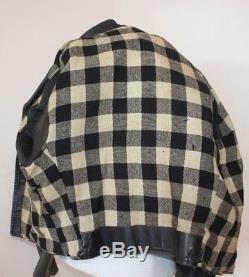 I rate the Jacket as Very Good used. Please make up your own mind. Please take the time to measure a similar garment that fits you to compare. Measures - across at Chest (A) 23 inches --- Shoulders (B) 18" --- Shoulder to cuff (C) 26.75 --- Length (D) 27" from collar to bottom inches. 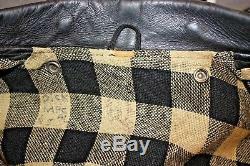 The item "VTG 40's 50s Horsehide Motorcycle Leather Jacket 44 M-L Buco Harley plaid lined" is in sale since Tuesday, January 1, 2019. 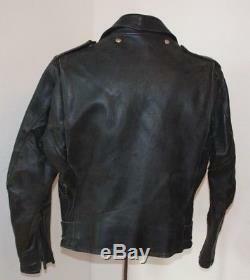 This item is in the category "Clothing, Shoes & Accessories\Vintage\Men's Vintage Clothing\Outerwear Coats & Jackets"." and is located in Morriston, Florida. This item can be shipped to United States.